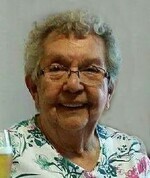 Rose Loney Obituary - Haileybury, Ontario | Buffam Leveille Funeral Home Ltd.
Loney, Rose Alma - With sadness the family announces the death of Rose Alma Loney at the age of 78 years.Mrs Loney passed away suddenly, Wednesday, August 16, 2017 at Thunder Bay Regional Health Science Centre. Born February 26, 1939 at Longlac, to the late Alphonse Waboose and the late Edna Finlayson. Mrs Loney had been a longtime resident of Temagami and a member of St Elizabeth Catholic Church. She loved bingo and volunteering for her church. Mrs Loney also enjoyed her daily coffee time with the residents at 5 Bayview Lane in Temagami. She is remembered as a loving mother and grandmother. She will be sadly missed. Predeceased by her parents, her husband Jack Loney, brother Russell Waboose and sister Dolores Levesque. Sadly missed by her sons: Mark [Faye] Loney of Longlac, Mike [Helen] Loney of Temagami and Steve [Darlene] Loney of Temagami. Fondly remembered by her grandchildren: Debra, Timothy, Trevor, Ashley, Eddie and Natasha; great-grandchildren: Scarlett, Fallyn, Tamara, Jacob and Laney; and by her siblings: Irvin "Sonny" Waboose [Veronica], Maurice Waboose [Mary Jane] and Caroline Levesque [late Jean-Marc]. The Loney family will welcome friends at St Elizabeth Catholic Church in Temagami, Sunday, August 20, 2017 from 7:00 to 9:00 and Monday, August 21, 2017 beginning at 9:00. Funeral mass will be celebrated from St Elizabeth Catholic Church Monday, August 21, 2017 at 11:00. Father Francis Ezenezi officiating. Interment will follow at Whispering Pines Cemetery. Memorial contributions to the Heart and Stroke Foundation will be gratefully acknowledged. Condolences, contributions and memorial candles may be left at www.buffamleveille.com.